Back when I was still a fairly new mom and my night’s sleep was a fun game of Russian Roulette, I started putting my breakfast on the stove the night before so that I wouldn’t have to use my brain in the morning. I bought these fancy steel cut oats and the side of the can said that they would take 40-60 minutes to cook, but THEN, at the very end of the directions, it said, “For quick-cooking method, let the oats soak in water overnight and then boil for 10 minutes.” This was the answer to needing breakfast after a who-knows-how-much-sleep kinda night! I would literally add everything to the pot the night before – the butter, the pinch of salt and even stuck my stirring spatula in there so that I would not have to use even one iota of brain cells to make breakfast. I’ve been doing this a few times a week ever since! On days that I run out of steel cut, I just use plain rolled oats, except I don’t soak them overnight. I just like the steel cut – they are chewy and interesting and they don’t turn to glue and mush after they go cold, so they are perfect for making a big batch on Monday and then warming them up with a splash of milk the next day – it’s always a great texture! Most commonly, I make chocolate oatmeal. It’s Olive’s favorite and I love hearing her request it the first second she sees me in her room in the morning “Chock-ate oatMEEEEL? !” I’ll add that recipe to the end of this one for those who saw it in my Week in the Life post! For today I recreated my favorite dessert bread at our grocery store – Apricot White Chocolate! I had a little of everything and so I went for it, and it was amazing! 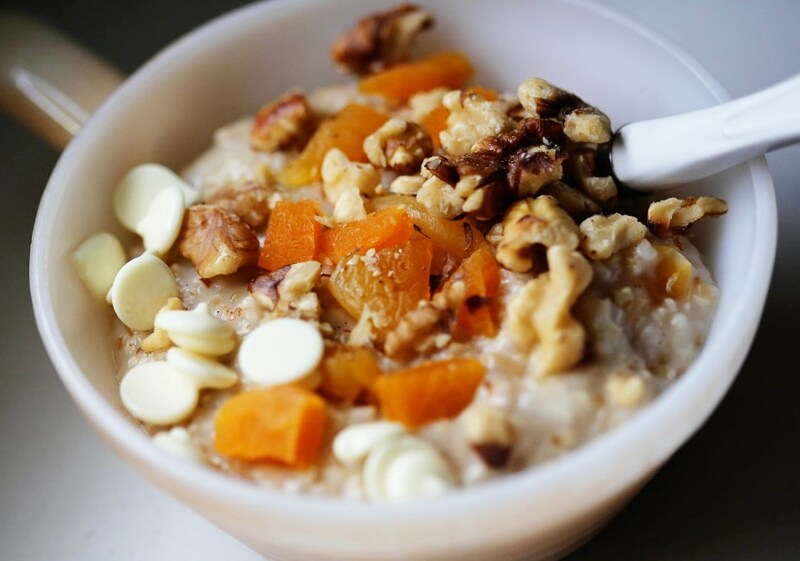 What’s fun about oatmeal is the various toppings you can add – so if you have guests for the weekend, make a huge pot and set out an array of dried fruits, nuts, fresh fruits or syrups and let them add what they want! Great for kids, for people watching their diet and for picky eaters! Right after Top Chef is over, before you check Facebook for the 75th time, put a large saucepan on the stove and add the steel cut oats, water, butter, vanilla and salt. Place a rubber spatula in the pot, too, so you won’t have to think at all in the morning. Go to bed. First thing in the morning, or 10 minutes after your toddler starts talking in her crib, turn on the burner to medium-high heat and bring oats to a boil. Lower the heat to medium and continue to simmer for 10-15 minutes, stirring occasionally until the liquid is absorbed. Add a splash of milk or cream if it gets too thick and taste for texture. If it’s to your liking, remove from heat, place a small portion in a bowl and stick it in the fridge to cool a bit for the toddler while you assemble yours. Stir in the white chocolate chips till they melt and then top with the dried apricots and walnuts. Take the kid’s portion out of the fridge, stir again, and then add a few chips so she can stir them around or pick them out herself and discard the rest. That’s at least how it happened to me. I love banana and chocolate. Near the end of the cooking time, I add the cinnamon to the pot and stir to incorporate. I take the pot off the heat and stir in the chocolate chips until an adequate darkness is achieved. This may call for more chocolate. Because I use 70%, I have no guilt and no shame. Top with sliced bananas and eat! Sometimes I shake it up and stir in dried cranberries. The cranberry/chocolate or banana/chocolate combo is always a winner. 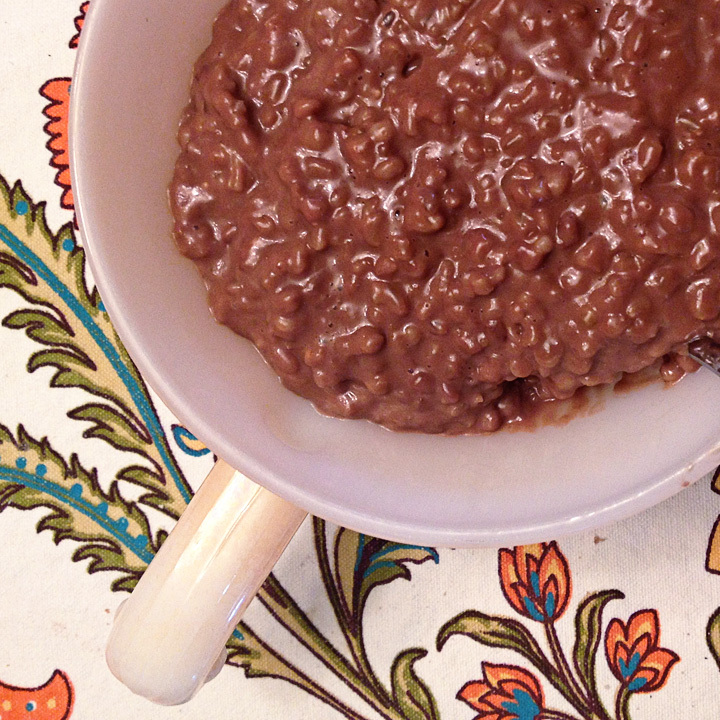 Do what you feel with the toppings, but more often than not, we just do plain chocolate oatmeal! Olive is never disappointed. This entry was posted in Baby Food Recipes, Breakfast, Chocolate, Cooking Tips, Healthy Meals and tagged apricot, breakfast, chocolate, dark chocolate, easy breakfasts, oatmeal, overnight oatmeal, steel cut oatmeal, white chocolate apricot. Bookmark the permalink. Oh my goodness, that sounds perfect, easy, and most of all delicious! Thanks! 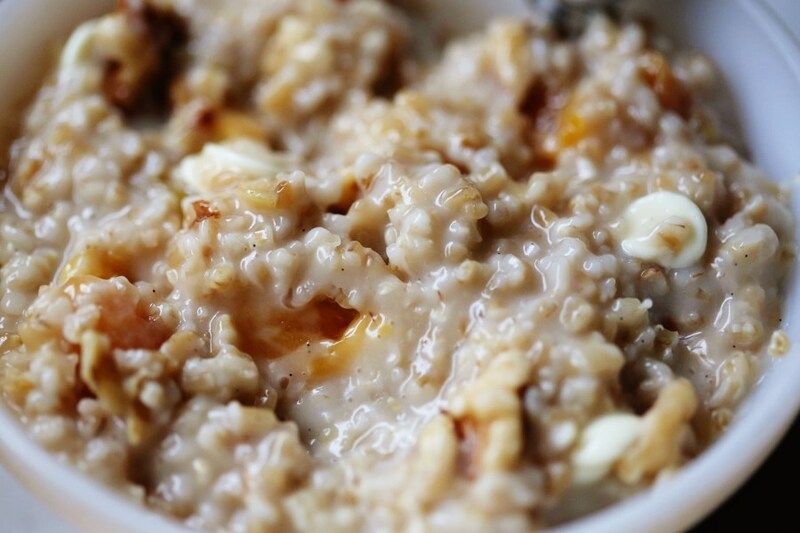 Love steel cut oats! Another favorite addition in our house is cinnamon, raisons, pecans or walnuts, with fresh apple plopped in as I begin to cook. When I have had an abundance of oranges, I’ve added pecans and cranberries with chopped oranges thrown in at the end. Looking forward to adding chocolate for the first time! You’ll never go back! 🙂 Your additions sound wonderful!